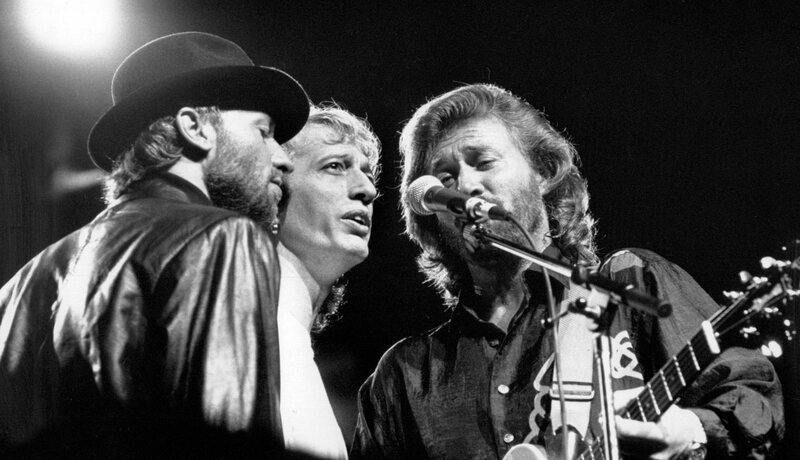 The Bee Gees have sold more than 220 million records worldwide, making them one of the world’s best-selling music artists of all time. They were inducted into the Rock and Roll Hall of Fame in 1997. The Bee Gees were a pop music group formed in 1958. Their line-up consisted of brothers Barry, Robin and Maurice Gibb. The trio were successful for most of their decades of recording music, but they had two distinct periods of exceptional success; as a popular music act in the late 1960s and early 1970s, and as prominent performers of the disco music era in the late 1970s. The group sang recognisable three-part tight harmonies; Robin’s clear vibrato lead vocals were a hallmark of their earlier hits, while Barry’s R&B falsetto became their signature sound during the late 1970s and 1980s. They wrote all of their own hits, as well as writing and producing several major hits for other artists. Only Elvis Presley, the Beatles, Michael Jackson, Garth Brooks and Paul McCartney have outsold the Bee Gees. Born on the Isle of Man to English parents, the Gibb brothers lived in Chorlton, Manchester, England, until the late 1950s where they formed the Rattlesnakes. The family then moved to Redcliffe, in Queensland, Australia, and then to Cribb Island. After achieving their first chart success in Australia as the Bee Gees with “Spicks and Specks” (their 12th single), they returned to the UK in January 1967 where producer Robert Stigwood began promoting them to a worldwide audience.